Trabzon is not one of my favourite cities in Turkey, yet it serves as a good base for sightseeing in the area. Although few western tourists go in that direction, people from the Middle East are a frequent sight. During the 1990’s, it also enjoyed great financial success as a central hub of the suitcase tourism trade. Socialism in the Soviet Union and Eastern Europe had fallen. Travel restrictions were lifted, prompting Russians and other Eastern European citizens to travel regularly to Turkey for cheaper goods to sell back home. Estimations are that it generated a staggering 10 billion USD a year. These days, many Turkish travel agents sell 4-day tours. My original plan was to go solo, but I also wanted to head further east and inland to the Kackar mountain range. Going solo was turning out expensive, so I signed up for a 7-day tour around the region. It was a good move to make because I saved a lot of money. My local guide had also lived his whole life in the city, so I tapped into a lot of cultural and historical information that wasn’t on the internet. Trabzon is on the northeast coastline of Turkey, near the Georgian border. It is close to Rize city that is the tea producing capital of the country. The local population is roughly 770,000, including the urban areas. Some people from Trabzon describe themselves as Laz, which is a prominent ethnic group in this area. Throughout history, its strategic position on the Black Sea coast made it a famous trading port, especially on the old Silk Road. What is Trabzon Famous For? Trabzon is often called the city of sultans because it was the birthplace of the famous Ottoman sultan, Suleiman the Magnificent. Within Turkey, its football team is widely recognised, but it also has a claim to fame because of its hazelnuts. The climate and soil conditions ensure the quality is high, so every year; Turks export thousands of tonnes around the world. Naturally, being close to the coastline, Trabzon has a thriving fishing industry, and this shines through to regional dishes of which many include hamsi (anchovies.) One cultural aspect that I adore about Trabzon is the Horon dance. Although unique to the Black Sea region and not just Trabzon, it is a marvellous display of quick and agile uniformed dancing. Trabzon has a humid, subtropical climate that is entirely different from the winter and summer climates of the Aegean and Mediterranean coasts. I visited in June, and while the daytime temperatures were pleasantly warm, I was extremely cold at nighttime, especially when I travelled further inland. Average summer temperatures are between 20 to 25 Celsus, while in winter, snow often falls. The airport is the easiest and quickest way. The runway of Trabzon airport is next to the sea, and I distinctly remember as we were coming into land, thinking that we were making a sea landing. Other than that, its domestic terminal is busier than its international and many foreign nationalities catch a connecting flight from Istanbul. For airport transfers, it is just a 15-minute drive from the airport to the city, so I grabbed a taxi. Although Havas do run a bus transfer service and the timetable is here. Otherwise, the countrywide bus network system has many services running to Trabzon but from places like Istanbul, it is often a 13 hour overnight journey. 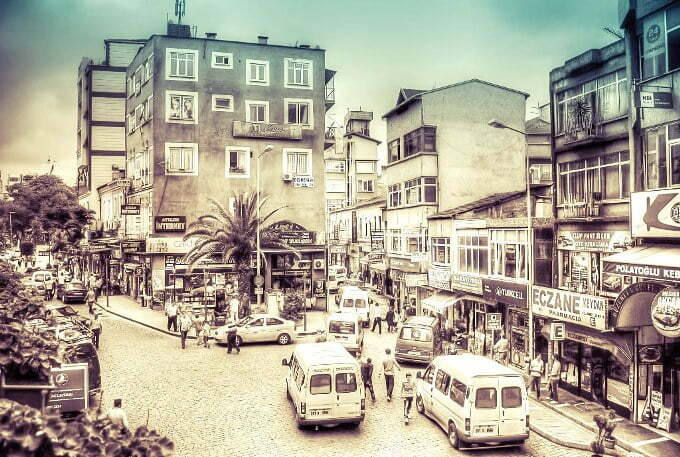 Trabzon is the 30th largest city in Turkey, so naturally, shops sell everything and anything. Trabzon Forum though is the most popular shopping mall. Including a cinema, as well as a children’s entertainment centre, hundreds of brand name shops open their doors every day. Over the last two years, real estate in Trabzon has gained traction with foreign property buyers and investors. These are mostly new build apartments attracting interested parties with low prices. One of the most popular neighbourhoods is Yomra that is on the outskirts of the city centre. This district is mainly middle of the range property with easy access to the city centre. Put aside one day to explore the attractions of Trabzon city centre. I personally loved my time strolling by the seaside with its quaint cafes and photo opportunities. My guide also took me to the 13th century Hagia Sophia of Trabzon. Much smaller than the building with the same name in Istanbul, the interior frescoes and ancient architecture impressed me immensely. In the same year that I visited the museum, an application was made to turn it into a mosque. It was approved but a legal lawsuit kicked into action and for now, the museum status remains as is. Ataturk Pavilion, an important three-storey, 19th mansion, and a popular place for locals to have wedding photographs taken, holds personal items bequeathed to the Turkish Republic by its founder Mustafa Kemal Ataturk. 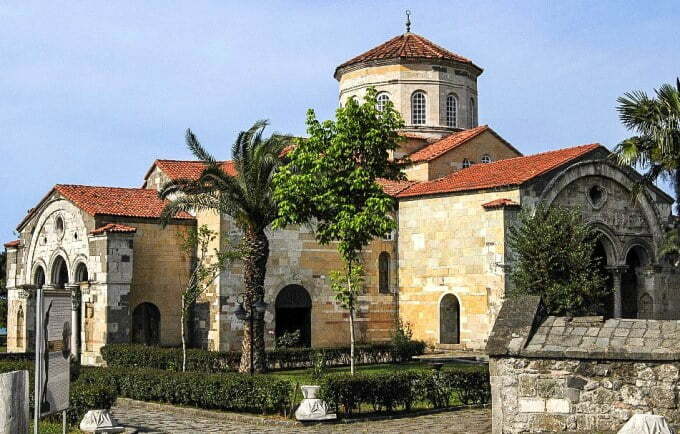 The third most famous landmark of Trabzon is the 16th-century Gulbahar mosque and tomb. Trabzon also has an ancient castle although little remains of it. 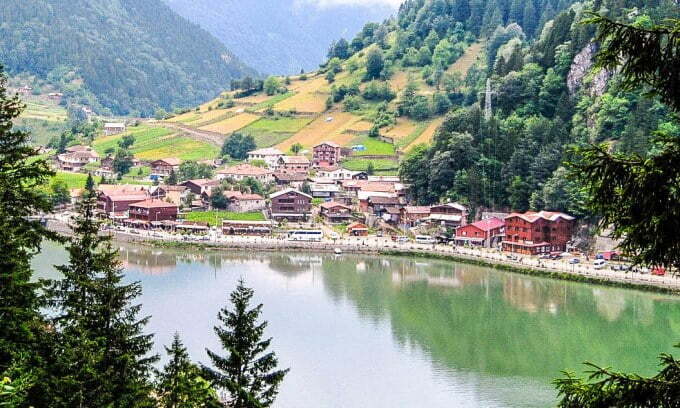 Most Trabzon travel guide books recommend a trip to Uzungol, a large beautiful lake surrounded by thick, dense forests. It is 100 kilometres from Trabzon and a 90-minute drive. Many tour agencies in Trabzon sell day trips there, but I stayed overnight instead, in one of Uzungol’s traditional hand built wooden hotels. This gave us more time to explore, further inland, especially the Demirkapi plateau. 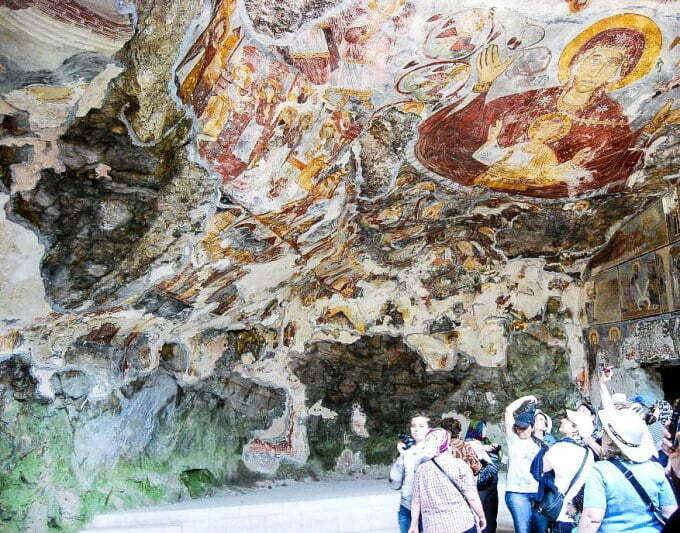 Without a doubt, one of the must see places while in Trabzon is the 4th-century Greek Orthodox Sumela Monastery. Perched on the side of a cliff, in the Macka district, it is just a short drive from Trabzon city centre. The walk up was extremely tiring but worth it to see the frescos of the church, the fantastic view and the simple rooms used by monks. For the history as well as extensive armchair guides to Hagia Sophia and Sumela Monastery, the Trabzon travel guide book by local resident Ismail Kose is extremely informative. I have not seen it for sale on Amazon or other websites, but it is widely sold in the city itself. Co-author: Bayram Tekce is a Turkish estate agent currently working on his project of a luxury villa in Trabzon. Residing in the Antalya district, he loves to travel around Turkey to learn about the history and diverse culture of his country.